The accompanying image suggests that the articulated suspension used by the Hyundai concept is normally folded up and back when used on-road. In other situations, however, the legs fold out to give the Elevate significantly more ground clearance. It also appears possible that the jointed construction would allow it, indeed, to walk, not just roll, over rough terrain. We can’t see the rear of the vehicle but would expect to see something similar for the back suspension. What we do know is that the Hyundai Elevate would be fully electric. Since there appears to be no driveshaft or other way to motivate the front wheels we can surmise that there are likely to be hub motors mounted within those wheels, a technology that is beginning to gain some credibility, with potential applications in everything from e-bikes to garbage trucks. The Elevate appears to use some of the technology now being integrated into advance robots that are capable of walking, running, even jumping and doing backflips. 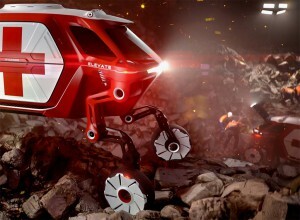 The Hyundai Elevate is by no means the only concept vehicle designed to showcase alternative approaches to propulsion. Just last year, Nissan rolled out the 370Zki, a modified version of its two-seat coupe that replaced its front wheels with a pair of skis, the back wheels transformed into a snowmobile-style track system. Whether Hyundai is serious about the Elevate is unclear. We hope to find out more at CES next Monday. This entry was posted on Wednesday, January 2nd, 2019 at and is filed under Auto Shows, Automakers, Automobiles, CES, Concept Cars, EVs, Electrified Vehicles, Events, Executives, Hyundai, Markets, Personalities, Sales, Technology, U.S./North America. You can follow any responses to this entry through the RSS 2.0 feed. Both comments and pings are currently closed.